If you’ve been looking for a way to increase brand awareness, test new markets, engage customers, and generate revenue, you’ve probably been considering a pop-up store. If the decision to do a pop-up shop for your online business is a yes, you next need to figure out the details of how that’s going to work. You probably have a lot of questions. Where will your pop-up be? How will you find a location? How do you evaluate the right space? What are the laws and regulations you need to know? In this post, we’ll explore the nuances of finding the ideal place for your pop-up store so you can pinpoint the best possible location for your in-person event. When it comes to checking out potential spaces, you have a few different options to consider. Think about the goals of your pop-up store, and then decide which of these routes is most likely to produce the results you’re after. If you’re looking to tap into a specific set of customers, hosting a pop-up shop within an existing retail store can be a great way to reach a highly relevant audience. This is good news for the store owner, too–as your pop-up shop fee will help offset their rent expenses. Think of a store whose target customers and branding align with yours–and then reach out to see if you can partner up for a special shopping event. 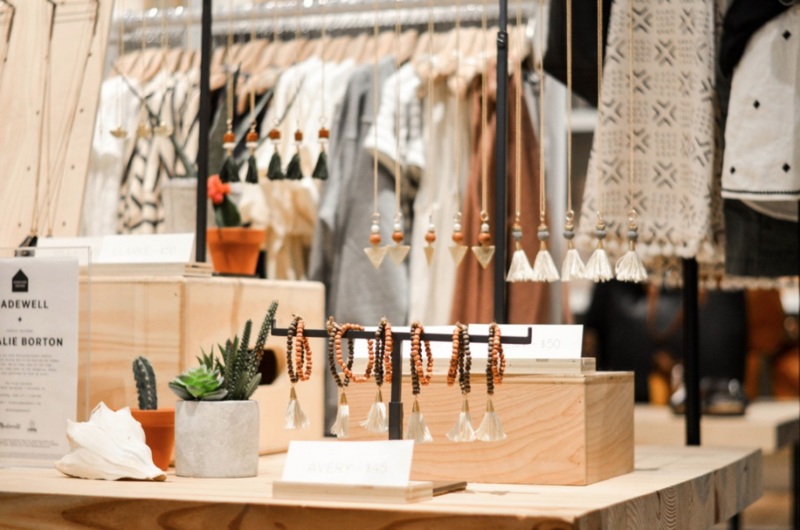 For example: Online jewelry retailer Natalie Borton partnered with female fashion retailer Madewell for a special in-store pop-up shop. At the event, shoppers had the chance to meet the designer, buy her products (that fit nicely with the brand’s overall aesthetic), and enjoy some special refreshments. This helped Madewell get more foot traffic as Borton was able to spread the word about the event to her local following, and Madewell’s shoppers got the chance to be introduced to a new designer, too. Win-win! Best for: This option makes a lot of sense if you’re working with a small budget, don’t need a large space for your products, and if you’re looking to attract an existing retailer’s demographic of shoppers. Malls and shopping centers make sense for a pop-up store because they’re a go-to place for shoppers who are in the ready to buy mindset. In these locations, you can often either rent a kiosk or booth in the mall’s high traffic central zone or sometimes, you can do a limited time store setup in a retail space that’s been vacant for a while. 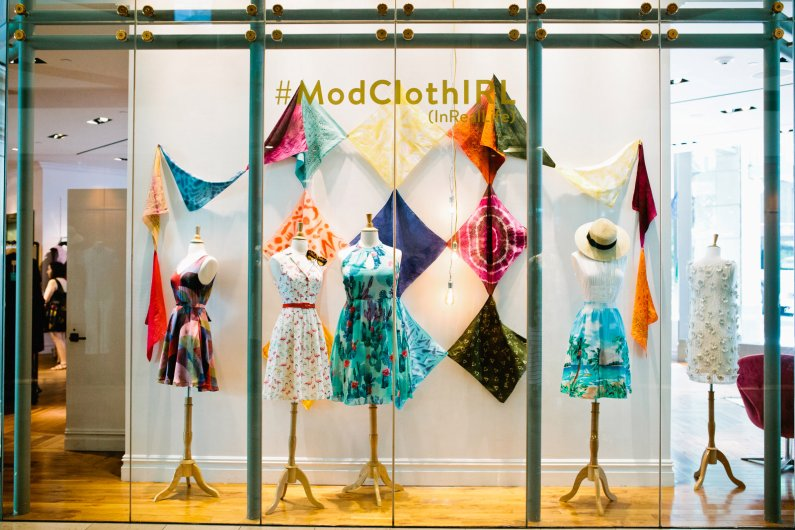 For example: Online retailer Modcloth experimented with renting out vacant space in a shopping center in late 2016 by offering limited time pop-up shops–and as a result of successful experiments in different shopping centers around the US, decided to keep several locations open year-round. Best for: Renting space within a mall or shopping center makes sense if you have a lot of product and if you want a standalone selling space that you don’t have to share. Kiosks are cheaper than full-store space rental, but if you’re wanting to create a full-blown shopping experience for the customer, renting out a vacant storefront for a short time will offer the space you need to really make a lasting impression. With the right permits, some brands find that busy outdoor spaces make ideal places for their pop-up shops. In these instances, being in an area of high foot traffic is essential–so make sure to look for a space that will bring lots of potential buyers right by your pop-up’s location. For example: Online beauty subscription box retailer BirchBox tested this method in multiple spaces around the US, but they took things a step further: Along with products, they offered passersby an experience. Manicures, astrology readings, and other beauty perks were offered to customers who stopped by. Keep in mind that for this option, adding an experience element is a good idea, as it gives people an extra reason to stop and look around at your outdoor pop-up shop. It’s not likely that a mall or shopping center will permit you to host your own mini-event within their venue, so this opportunity is unique to this option. If you decide to add the experience element, think about what low-cost, hands-on activities you can tie in to showcase your products. If it’s clothing you’re selling, maybe it’s a dressing room and a photo booth. If it’s around the holidays, maybe it’s a gift wrapping station. You can get creative. 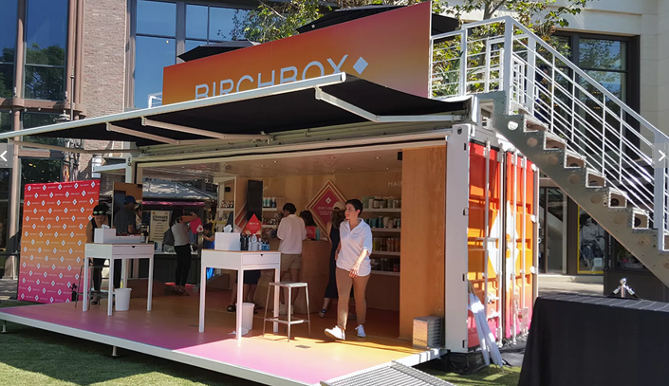 Best for: Outdoor pop-ups can help you capture event overflow, attract all different types of audiences, and aren’t constricted to the retail environment of a shopping mall or another store’s retail space. This work well for brands wanting to reach a diverse crowd and meet a high volume of new customers. Space within another store: Small scale, low investment, partnership opportunity, ability to capture a store’s existing demographic of shoppers. Shopping centers/malls: Allows you to make a big impression without having to share the spotlight. More expensive, but gives you more room and access to general foot traffic. Outdoor setups: Good for high-traffic areas, attracts a diverse audience. Ideal for capturing general foot traffic or event overflow. Ask local real estate agents if they know of viable spaces that have allowed pop-up shops in the past. Reach out to the store owner/property owner directly if you find a space that looks ideal. Put together a list of existing retail stores who have partnered with similar brands in the past. Connect with other online retailers who have put together pop-up shops in the past and ask how they found their spaces. Aside from these grassroot-style efforts, you can also check out some online marketplaces geared specifically toward helping people book pop-up spaces. From here, put together a running list of potential locations with the pros and cons of each space. Next, you’ll start thinning down this list to figure out which option is the best one for your pop-up store. Start the evaluation process by making a pros and cons list and looking at a few different factors that can help determine which is the best option for you and your brand. Budget: Different spaces will have different costs associated with them, so be sure that your investment in a pop-up store location leaves a room for you to profit on the event. Some research indicates you can expect to spend anywhere from $1,500-$25,000 depending on the scale and run time of your pop-up shop. Target Audience: Choose the space that’s most likely to bring you your target customers, that has complementary retailers nearby, and that would pull foot traffic.If the space isn’t likely to be visited by one of your target personas, it’s probably not a good option. Space: Depending on the size and type of your products, you may need a little or a lot of space to stock your pop-up shop. Make sure there is enough room for you to effectively display products and to store additional product for re-stocking, as well as room for customers to browse. With a narrowed down list and one or two highly viable options, you can start to move ahead and make sure you have the appropriate permits, licenses, and permissions to put your pop-up store plan into action. Before you move too far ahead, there are a few important legal documents and permissions you’ll need to make sure your pop-up store is 100% safe from any legal situations, so be sure you’ve got the appropriate documentation on-hand. A business license: See if the state or city requires you to have a business license or registration, and make sure your filing is up-to-date. Special license/permit for your product type: If you’re selling a product with regulations (alcohol, food, etc. ), you may need special permits to sell in your pop-up store. Check with local and state departments to get the right permissions before the event. Lease agreement: You need a written agreement with the business or property owner you’re working with, which usually comes in the form of a lease. Review the fine print of this document carefully and make sure you know the ins and outs of the agreement you’re getting into. Insurance: It’s likely you’ll need to purchase additional insurance coverage for your physical store event. Talk to your insurance agent to find out if there are short-term riders you can tack on to your current policy, or find out if the property manager is providing full coverage. If you’re missing one of these important documents, you could quickly find yourself in a costly lawsuit or dealing with fines. Get all of your paperwork in order before you plan the specifics of the event. Once you’ve considered all of the variables we’ve discussed here, you’ll be on the right path for a successful, secure, and profitable event. Remember to think about how your location will contribute to your ultimate objectives–and factor in various costs when making your choice. In doing so, you’ll be choosing the best possible place that helps you connect with new customers who become loyal, long-term customers.